Bu çalışmada, çift taraflı Tip II sansürlenmiş (doubly Type II censored) örneklemler için Jones ve Faddy’ nin çarpık t (Jones and Faddy’ s Skew t - JFST) dağılımının konum ve ölçek parametrelerinin en çok olabilirlik (maximum likelihood - ML) ve uyarlanmış en çok olabilirlik (modified maximum likelihood - MML) tahmin edicileri elde edilmiştir. Monte Carlo (MC) simülasyon çalışması kullanılarak ML ve MML tahmin edicilerinin etkinlikleri karşılaştırılmıştır. MC simülasyon çalışması, MML tahmin edicilerinin ML tahmin edicileri ile hemen hemen aynı etkinliğe sahip olduğunu göstermiştir. Çalışma sonucunda, odaklanılan nokta tahmin edicilerin etkinlikleri ise ML tahmin edicilerinin, etkinlikle beraber hesaplama zorlukları ele alındığında ise MML tahmin edicilerinin tercih edilmesi gerektiği belirlenmiştir. In this study, we obtain the maximum likelihood (ML) and the modified maximum likelihood (MML) estimators for the location and the scale parameters of the Jones and Faddy’s Skew t (JFST) distribution based on the doubly Type II censored samples. Then, we use the Monte Carlo (MC) simulation study to compare the efficiencies of the ML and the MML estimators. The MC simulation study shows that, MML estimators have more or less same efficiency with the corresponding ML estimators. At the end of the study, it can be concluded that if we focus on the efficiencies of the estimators, we prefer to use ML estimators. However, if we focus on the computational difficulties together with the efficiencies of the estimators, we prefer to use MML estimators. Tiku, M. L. (1967a). A Note on Estimating the Location and Scale Parameters of the Exponential, Aust. J. Stat., 9, 49-54. Tiku, M. L. (1967b). Estimating the Mean and Standard Deviation from a Censored Normal Sample, Biometrika, 54, 155-165. Tiku, M. L. (1968a). Estimating the Parameters of Normal and Logistic Distributions form Censored, Aust. J. Stat., 10, 64-74. Tiku, M. L. (1968b). Estimating the Parameters of Log-Normal Distribution from Censored Samples, Amer. Stat. Assn., 63, 134-140. Tiku, M. L. (1968c). Estimating the Mean and Standard Deviation from Progressively Censored Normal, J. Indian Agric. Stat., 20, 20-25. Tiku, M. L. (1971). Estimating the Means and Standard Deviation from Two Censored Normal, Biometrika, 58, 241-242. Tiku, M. L. (1973). Testing Group Effects from Type II Censored Normal Samples in Experimental, Biometrics, 29, 25-33. Tiku, M. L. (1977). Estimating and Testing Group Effects from Type I Censored Normal Samples, Commun. Stat. – Theor. Meth., 6(15), 1485-1501. Balakrishnan, N., ve Mi, J. (2003). Existence and Uniqueness of the MLEs for Normal Distribution based on General Progressively Type-II Censored Samples, Statistics & Probability Letters, 64, 407-414. Şenoğlu, B., ve Tiku, M. L. (2004). Censored and Truncated Samples in Experimental Design Under Non-Normality, Statistical Methods, 6(2), 173-199. Wu, J.W., Lee, W.C., ve Shen, S.C. (2007). Computatioanl Comparaison of Prediction Future Lilfetime of Electronic Components with Pareto Distribution based on Multiply Type II Censored Samples, Applied Mathematics and Computation, 2007, 374-406. Cristan, A. C. (2007). Using the EM algorithm for Inference in Mixture of Distributions with Censored but Partially Identifiable Data, Computational Statistics & Data Analysis, 51, 2769-2781. Vaughan, D. C., ve Tiku, M. L. (1993). Testing the Equality of Location Parameters of Exponential Populations from censored samples, Commun. Stat.-Theor. Meth., 22, 2567-2581. Balakrishnan, N., ve Kateri, M. (2008). On the Maximum Likelihood Estimation of Parameters of Weibull Distribution based on Complete and Censored Data, Statistics and Probability Letters, 78, 2971-2975. Sun, X., Zhou, X., ve Wang, J. (2008). Confidence Intervals for the Scale Parameter of Exponantial Distribution based on Type II Doubly Censored Samples, Journal of Statistical Planning and Inference, 138, 2045-2058. Balakrishnan, N., ve Dembinska, A. (2008). Progressively Type-II Right Censored Order Statistics from Discrete Distributions, Journal of Statistical Planning and Inference, 138, 845-856. Deng, J., ve Pandey, M. D. (2008). Cross Entropy Quatile Function Estimation from Censored Samples Using Partial Probability Weighted Moments, Journal of Hydrology, 363, 18-31. Saffari, S. E., Adnan, R., ve Greene, W. (2012). Parameter Estimation on Hurdle Poisson Regression Model with Censored Data, Jurnal Teknologi, 189-198. He, Q., ve Nagaraja, H. (2012). Fisher Information in Censored Samples form Downton's Bivariate Exponential Distribution, Journal of Statistical Planning and Inference, 142, 1888-1898. Ortega, E. M., Cordeiro, G. M., ve Lemonte, A. J. (2012). A Log-Linear Regressione Model for the Beta-Birnbaum-Saunders Distribution with Censored Data, Conputational Statistics and Data Analysis, 56, 698-718. Lopez, O., ve Pierre, P. S. (2012). Bivairiate Censored Regresiion Relying on a New Estimator of the Joint Distribution Function, Journal of Statistical Planning and Inference, 142, 2440-2453. Basak, I., ve Balakrishnan, N. (2012). Estimation for Three-Parameter Gamma Distribution Based on Progressively Censored Data, Statistical Methodology, 9, 305-319. Saffari, S. E., Adnan, R., ve Greene, W. (2013). Investigating the Impact of Excess Zeros on Hurdle-Generalized Poisson Regression Model with Right Censored Count Data, Statistica Neerlandica, 67, 67-80. Balakrishnan, N., ve Davies, K. F. (2013). Pitman Closeness Results for Type-I Censored Data from Exponential Distribution, Statistics and Probability Letters, 83, 2693-2698. Rastogi, M. K., ve Tripathi, Y. M. (2013). Estimation Using Hybrid Censored Data from a Two-Parameter Distribution with Bathtub Shape, Computational Statistics and Data Analysis, 67, 268-281. Pradhan, B., ve Kundu, D. (2013). Inference and Optimal Censoring Schemes for Progressively Censored Birnbaum-Saunders Distribution, Journal of Statistical Planning and Inference, 143, 1098-1108. Cramer, E., ve Balakrishnan, N. (2013). On some Exact Distributional Results Based on Type-I Progressively Hybrid Censored Data from Exponential Distributions, Statistical Methodology, 10, 128-150. Matos, L. A., Lachos, V. H., Balakrishnan, N., ve Labra, F. V. (2013). Influence Diagnostics in Linear and Nonlinear Mixed-Effects Models with Censored Data, Computational Statistics and Data Analysis, 57, 450-464. Basso, R.M., Lachos, V.H., Cabral, C.R.B ve Ghosh P. (2010). Robust mixture modeling on scale mixtures of skew-normal distributions, Computational Statistics and Data Analysis, 54, 2926-2941. Flecher, C., Naveau, P. ve Allard, D. (2009). Estimating the closed skew-normal distribution parameters using weighted moments, Statistics and Probability Letters, 79, 1977-1984. Garcia, V.J., Gomez-Deniz, E. Ve Vazquez-Polo, F.J. (2010). A new skew generalization of the normal distribution: Properties and applications, Computational Statistics and Data Analysis, 54, 2021-2034. Mameli, V. (2015). The Kumaraswamy skew-normal distribution, Statistics and Probability Letters, 104, 75-81. Mudholkar, G.S. ve Hutson, A.D. (2009). The epsilon-skew-normal distribution for analyzing near-normal data, Journal of Statistical Planning and Inference, 83, 291-309. Jones, M.C. ve Faddy, M.J. (2003). A skew extension of the t-distribution, with applications, J.R. Stat. Soc. Ser. B, 65, 159-174. Acitas, S., Senoglu, B. ve Arslan, O. (2015). Alpha-Skew Generalized t distribution, Revista Colombiana de Estadistica, 38(2), 353-370. Acitas, S., Kasap, P., Senoglu, B., ve Arslan, O. (2013). One-step M-estimators: Jones and Faddy's skewed t-distribuiton, Journal of Applied Statistics, 40(7), 1545-1560. Acitas, S., Kasap, P., Senoglu, B. ve Arslan, O. (2013). Robust estimation with the skew t2 distribution, Pakistan Journal of Statistics 29(4), 409-430. Arslan, M.S.T. (2015). Tam ve Sansürlü Örneklemler için Deney Tasarımı Model Parametrelerinin Dayanıklı Tahmini, Doktora Tezi, Eskişehir Osmangazi Üniversitesi, Eskişehir, Türkiye. Arslan, T. ve Şenoğlu B. (2016). Statistical Inference for the Location Model when the Distribibution of the Error Terms is Jones and Faddy’s Skew t : Type II Censored Samples, Internatioanal Conference on Trends and Perspectives in Linear Statistical Inference (LINSTAT’16), Istanbul, Turkey. ISNAD Arslan, Talha , Şenoğlu, Birdal . "ESTIMATION FOR THE LOCATION AND THE SCALE PARAMETERS OF THE JONES AND FADDY’S SKEW t DISTRIBUTION UNDER THE DOUBLY TYPE II CENSORED". 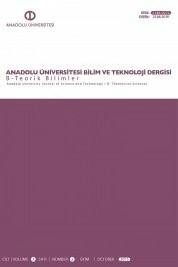 ANADOLU UNIVERSITY JOURNAL OF SCIENCE AND TECHNOLOGY –B Theoretical Sciences 5 / 1 (April 2017): 100-110.